A smoothly working MVP designed to showcase the client’s idea of an end-to-end web audio and video conferencing solution. The system was built within extremely tight timelines to quickly obtain investor approval and win over the funding for further development. 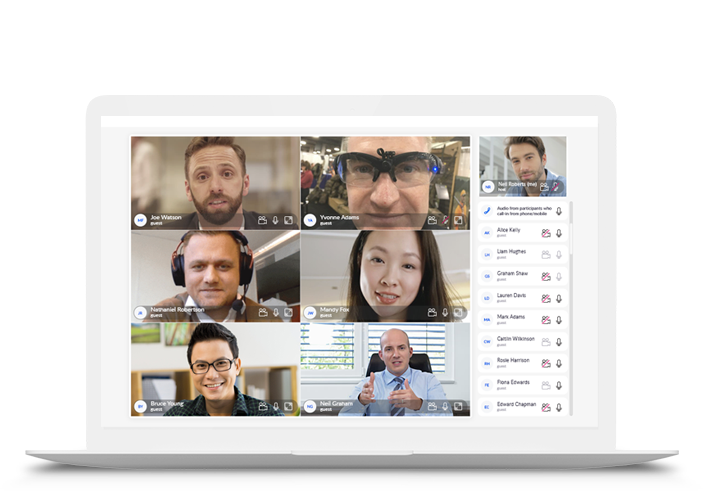 Integrated with an advanced audio bridge to provide a high-definition voice conferencing backend, the solution enables the users to set up large-scale online events with multiple real-time participants. Client: CCI is an Australia-based telecom business that provides conferencing services across Asia-Pacific. The company is a subsidiary of the MNF Group Limited, one of the region’s technology leaders that has been listed on the Australian Securities Exchange since 2006. A two-times winner of the Forbes Asia-Pacific “Best under a Billion” award, the Group extended its smart IP voice network to reach out to 250+ global providers and 100,000 retail customers. Currently, the company generates 50+ million minutes of audio conferencing annually. The client was aiming to extend their operator-assisted conferencing services and enter the competition among the global communication service providers, ASAP. So far as the client was after the investor pledge to make it to the market, they needed to impress the stakeholders with a full-featured and bug-free MVP that would be a breeze to use. The team’s scope of work included web app engineering, building the solution’s major webRTC module, SIP signaling connector, the UI for backend modules, and database management. To enable continuous delivery and allow for smooth app scaling and module integration, the team opted for a microservices-based architecture. As a result, Oxagile delivered an intuitive client-server web conferencing solution that features all the required functionality and is ready for implementation into the client’s working environment. Easily accessible from web, the system enables users to set up international group calls with up to 20 real-time participants. Oxagile proved the ability to smoothly handle high-risk, short-term projects under harsh timelines and strict quality requirements. The company assembled a team of senior-level software engineers and dedicated QA experts headed by a certified Project Manager with years of subject-matter expertise in the video domain. With a transparent app development process that’s been polished throughout 450+ projects, Oxagile managed to tackle the risks early on. The team made it to build a clean tech specification, nailed down an accurate SOW, and won the client’s confidence by fully living up to the commitments. The client plans to increase the platform’s resilience and scalability, bulking up its capacity to 20+ simultaneous video streams. The plans for the next release also include extending the solution’s functionality with voice encryption, recordings playback, whiteboarding, and more. The solution proved instrumental in testing the client’s idea and helped gather user feedback to translate into a roadmap for value-driven improvements. Delivered under strict timelines and right within the budget, the solution enabled the client to secure the necessary funding for the next development round.